The most convenient and comfortable way to get to Varanasi from Darjeeling is the train. 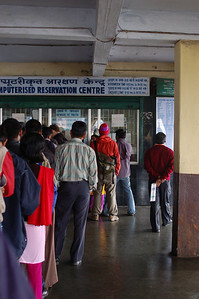 Unlike Kolkata, Darjeeling doesn't offer the luxury of the tourist booking office, so we joined the masses and queued up for our tickets. With the help of our trusty Indian Railways schedule, which I mocked Yann for purchasing, we had looked up our train number, kilometrage and calculated the subsequent fare for our journey. Yann muscled his way to the front of the enquiries counter to find out that every sleeper in every train heading to Varanasi was booked for at least one week. After a few more trip to the enquiries counter, we were informed that there were special "emergency tickets" (read: overpriced tickets for panicking foreigners), that we could purchase. To get one of these tickets you have to pay the fee for the full kilometrage of the train journey (in our case more than twice the distance), plus a 100 rupees "service charge". We forked over the money (three times the regular fare) instead of buying an unreserved ticket and possibly standing for the entire 16 hours (although I think that would have been extremely unlikely). We arrived at the train station well in advance and found our sleepers and settled in. All seemed fine until we arrived at one of the next stops. Dozens of people poured into our cabin, many settling on Yann's bed. I thought they would clear out once the train took off again and people found their seats, but I was wrong. At one point we had twelve people in our cabin (that sleeps eight) but the cabins next to ours had even more people packed in. People with unreserved tickets headed into the sleeper cabins and claimed any inch of space they could. On later trains we witnessed this happening to locals, who promptly waved their tickets and kicked out the intruders, but we weren't quite sure what to do. After a few hours, it was now late and the number of passengers in our cabin seemed to have grown. I climbed down from my bunk and searched for the conductor. When I finally found one, he pronounced that he was the "air condition class conductor" and he didn't deal with sleeper class. Thanks for your help! I returned to my lower class and found the conductor who roared back to our cabin and chased everyone off Yann's bed. Yann and I both felt embarassed as the two men just squeezed onto someone else's already crowded bed. Over the course of the evening, several passing men deemed it appropriate to touch my legs or any piece of exposed skin around my hips as they passed by. Not only was this extremely violating, it was keeping me awake and after multiple incidents I cracked and began yelling at people to get their hands off me. The offenders wouldn't make eye contact with me, but I got most of the cabin's attention and the touching stopped for the rest of the night. Upon exiting the train the next morning I noticed the large sign near the bathroom announcing that "harassing female passengers is a punishable offence". I didn't think people had to be told this. After ducking around corners and pausing at cafes to have drinks, we finally managed to evade our driver who was determined to bring us to a commission paying hotel. We settled in a lovely family guest house with only a few rooms and we had the whole rooftop to ourselves with a view of the city's Golden Temple and instructions from the owner not to leave anything on the clothes lines or the monkeys would get them. Our hotel was right in the middle of the Old City, narrow lanes, crowds of people and large cows taking up most of the room. Not a second goes by without an offer to buy scarves, or cold water, or a massage, or a rickshaw ride. 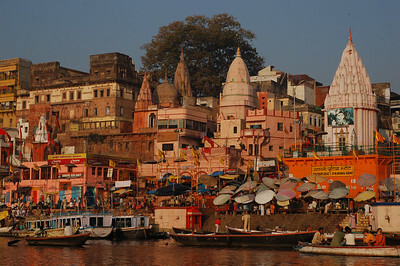 The city's main attraction is its dozens of ghats lining the Ganges river. 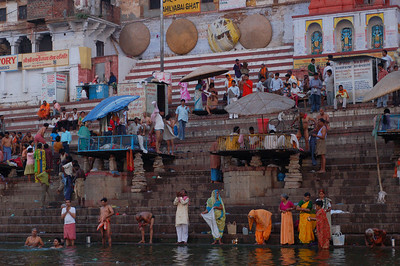 The ghats are the sites of non-stop holy action. People bathing, washing clothes, boating, playing cricket, making offerings from sunrise to sunset. 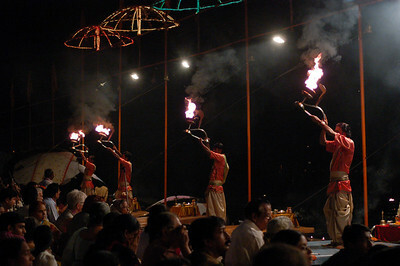 Every evening a puja ceremony, an offering to the Ganges is performed at the main ghat for crowds of pilgrims and tourists. We made sure to wake up before dawn one morning and hire a local boatman to paddle us along the ghats for two hours. 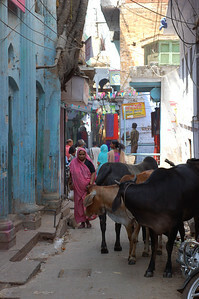 The minute the sun rises the temperature rises, and by early morning it is almost unbearable to walk along the ghats. Every square inch of shade is occupied by a vendor, a Saddhu (wandering Hindu holy man), or a beggar, for they have long days of work along the ghats. Burning ghats sit on either end of the strip of ghats. These are where bodies end up after being paraded through the Old City's narrow lanes in a spiritual procession. Huge piles of wood (the cost of the ceremony is determined by how much wood is used for the cremation), charred building and rising smoke indicate the presence of the burning ghats, but neither Yann or I felt like encroaching a ceremony, especially since touts hover around hoping to make money by demanding a "viewing fee". 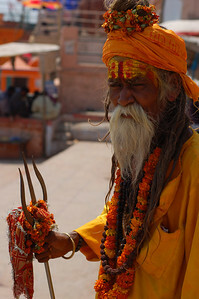 Not only the Saddhus roam around the ghats barefooted and spaced out. Foreigners on a search for spirituality, dreadlocks, inner peace, foot freedom, seem to congregate here for yoga or tabla lessons or just to soak up the spiritual atmosphere. I guess Yann and I aren't so mellow, the only inner peace we found was when consuming copious amounts of Indian food at local eateries, we left the meditating to others. (Response to the comment in my blog) I'll tell Joseph (dlP) he took the picture! hahahahaha! Speaking of searching for spirituality...here's a deep one. Hey Em! Yann, we've never met, but you already know me somewhat vicariously through Emilie. Your writing and photos are beautiful! Em, I saw your parents the other day (your mom signed my passport application). That's when I found out that the two of you have been trekking throughout the eastern parts of the world. Very impressive and exciting! I have so much of your blog yet to explore but, from what I've seen, sounds like a very interesting discovery of the world, yourselves, and everything else poetic (and cheesy). Do I really have to do 10 postings to get a postcard? Send me one now!!! Okay folks, I don't want to clog up the comment column too much... Take care, have fun, talk to you soon! Sorry I'm not well educated on how this blogging works...I didn't mean to post anonymously so I'm doing this again with my full name. I am sooooo pleased that you paid triple charge to get a sleeper rather than stand 16 hours. You have turned a corner (waita go Yann). But you make me laugh, laugh and laugh some more. It isn't Innocents Abroad (Mark Twain). It is so much better. And you aren't innocents either.